The Hip Hop duo Run The Jewels link up with JENESIS for an interview while out on tour promoting for their new Run The Jewels album. In part one, Killer Mike and El-P have a little fun and joke around about their idea of the way a person should decide on who they’re going to rob based on a number of important different factors. The duo also clarifies the meaning behind their group name, it’s symbolic significance and gets into details behind who they would choose in assembling a team for a heist. 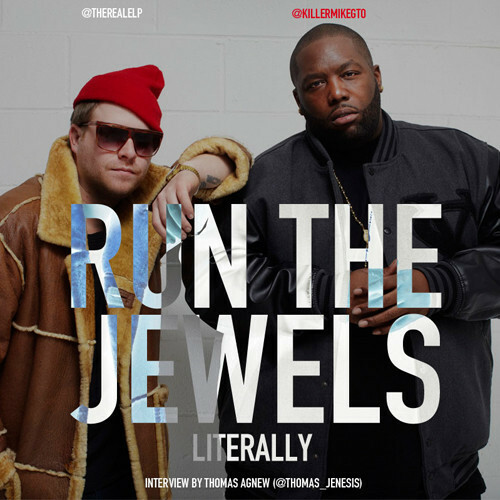 Part two of the interview with Killer Mike and El- P finds the rappers discussing how they would spend their money after a robbery, who would play them in a Run The Jewels feature film, their favorite robbery scenes and also share their thoughts on if they believe hip-hop is being robbed of it’s authenticity. This entry was posted in Audio, Interview and tagged audio, el-p, hip hop, Interview, jenesis, killer mike, rap, run the jewels. Bookmark the permalink.